At one point, Walmart blamed Morgan for his injuries. Now the company is being thanked. 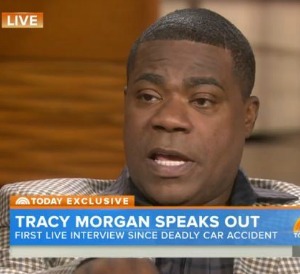 In a very emotional appearance on the Today show, Tracy Morgan (accompanied by his attorney Benedict Morelli) thanked his family, friends and doctors for helping him to get through the New Jersey Turnpike crash last year that left him severely injured and his friend, James McNair, dead. The appearance was also an opportunity to thank Walmart for agreeing to two settlements: one announced a while ago that provides for McNair’s family, and a recently announced settlement with Morgan. The “misunderstanding” he’s referring to was Walmart’s initial claim that Morgan was responsible “in whole or in part” for his own injuries because he wasn’t wearing a proper safety belt. At this point, a criminal complaint has been filed against the driver of the Walmart truck, Kevin Roper, who hadn’t slept in 24 hours at the time of the accident and was traveling 20 miles above the speed limit. Tracy Morgan is a popular comedian, and the severity of his injuries along with this affecting first public appearance made it necessary for Walmart to make amends and do the right thing. Even if it’s only because they want to avoid looking terrible in the end. A large corporation with a driver facing criminal charges needs to step up. In this case, Walmart already has a reputation as the harsh face of capitalism, which would only be exacerbated by dragging out this situation. On a lighter note, it’s great to hear that Morgan wants to come back to comedy. We would all enjoy that.